, corresponding to amino acids 358-372 of Rat Delta Opioid Receptor. Our Abpromise guarantee covers the use of ab10272 in the following tested applications. Function: G-protein coupled receptor that functions as receptor for endogenous enkephalins and for a subset of other opioids. Ligand binding causes a conformation change that triggers signaling via guanine nucleotide-binding proteins (G proteins) and modulates the activity of down-stream effectors, such as adenylate cyclase. Signaling leads to the inhibition of adenylate cyclase activity. Inhibits neurotransmitter release by reducing calcium ion currents and increasing potassium ion conductance. Plays a role in the perception of pain and in opiate-mediated analgesia. Plays a role in developing analgesic tolerance to morphine. Tissue specificity: Detected in oocytes (at protein level). Detected in brain cortex, hypothalamus, hippocampus and olfactory bulb. Detected in oocytes. Similarity: Belongs to the G-protein coupled receptor 1 family. PTM: N-glycosylated. Ubiquitinated. A basal ubiquitination seems not to be related to degradation. Ubiquitination is increased upon formation of OPRM1:OPRD1 oligomers leading to proteasomal degradation; the ubiquitination is diminished by RTP4. ab10272 at 1/1000 dilution staining Delta Opioid Receptor in transfected cells by Immunocytochemistry. Publishing research using ab10272? Please let us know so that we can cite the reference in this datasheet. Thank you for your enquiry. Unfortunately, this product has not been tested in western blot application. However, by running a SwissProt analysis, the expected molecular weight is around 40kDa. I hope this information will be useful to you. Should you require any further information, please do not hesitate to contact me. 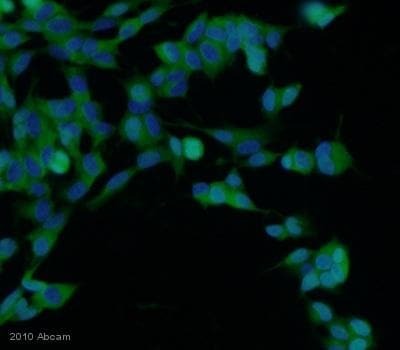 We have recently tried one of your anti-delta opioid receptor antibodies (ab10272). It worked in IF in the cells expressing human receptor, however there was some background seen in non-expressing cells. I wonder if you are planning to do affinity purification of this antibody. If not than we would be interested in buying 300-400 microliters. Can you give us discount for that? Lastly, I would like to bring it to your attention that there is a mistake in the datasheet for this product, the region the antibody was raised against is 360-372 not 122-138. Mark forwarded your request for a discount on ab10272 to my attention. We sell this product in units of 50µl and you have advised that you are likely to purchase 300-400 µl or 6-8 units. I would be pleased to offer you a 15% discount if you purchase 6-8 units on the same purchase order. Please quote reference DMMF1905-15% when placing your order to ensure that the appropriate discount is deducted. We already have several delta opioid receptor antibodies from different companies. However, we did not have much luck with them. We use CHO cells expressing human DOR1 to characterize antibodies in Western blots and cell-based assay that is most similar to ICC. Two antibodies from Santa Cruz, and one from USB detected band of about 60 kDa on WB, however the same band was seen in CHO cells expressing kappa receptor or non-expressing CHOK1 cells. Biosourse antibody recognized 45 kDa band in a similar manner, and Chemicon's antibody just stained everything. The only antibody that works nicely is phosphospecific antibody to (P)Ser363 from CST. It detects delta agonist-dependent phosphorylation at 60 kDA band in CHOhDOR cells only. The results of cell-based assay agree with the WB for all antibodies tested. I would be most grateful if you could give me technical advice. Do you compare your antibodies to the ones from competitors? Thank you for your enquiry and your interest in our products. We would like to confirm that ab10272 has only been tested and characterised for ICC application, and we do not have any information if it works for Western. We are very sorry to inform you that do not compare our antibodies to the ones from competitors. However, Abcam policy dictates that if a product does not performed as stated on the datasheet, we will offer a full reimbursement or provide a replacement of equivalent value.